Many of the younger blog followers like penguins, so today I'm going to post some paraphrased portions of a conversation with Jean Pennycook. Jean has been coming to Antarctica for well over 10 years and is as friendly as the little penguins she studies. Jean left McMurdo Station to go and camp at Cape Royds, to observe the Adelie Penguins for the rest of the summer. As of the last week in November, the Adelie penguins at Cape Royds have eggs on their nests and the parents are taking turns to go out to sea for feeding excursions. They have to walk from the rookery to the sea ice edge, which is about 1.5km (~1 mile) away - that's a long way for a little penguin to walk! At Cape Royds penguin chicks will hatch in mid- to late-December. Q: How many species of penguins live in Antarctica? There are four species in Antarctica - the Emperor, Adelie, Gentoo and Chinstrap. However, there are over 15 species of penguins. Penguins only live in the Southern Hemisphere and large numbers are in the colder regions such as Antarctica or the Sub-Antarctic Islands e.g. Macquarie Island or South Georgia. Various penguin species can also be seen in Australia, New Zealand, South Africa, Chile and Argentina. A common confusion is to forget that Penguins only live in the Southern Hemisphere and Polar Bears only live in the Northern Hemisphere. Polar Bears and Penguins will not meet! ... and don't forget that a penguin is a bird, it just happens to be flightless (but penguins are excellent swimmers). An Emperor Penguin colony seen from the air on our way to Cape Hallett a few weeks ago. The black dots are penguins, but the brown colour/color is due to penguin guano (poo! - ooogh). 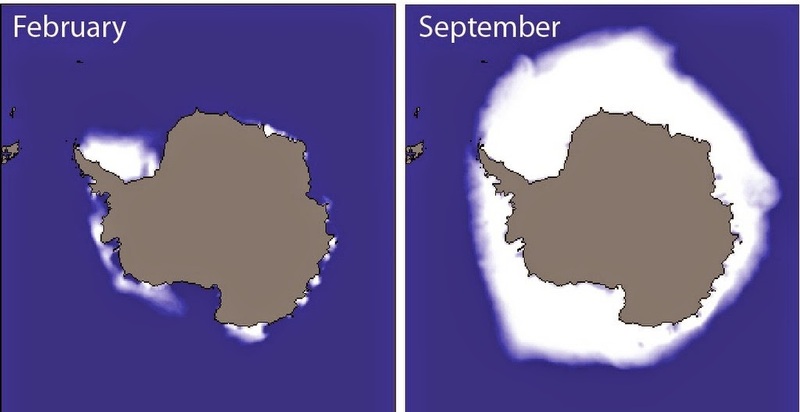 The discolouration of the ice has been useful for tracking penguin populations by satellite. Q: What are the largest, smallest and most common species of penguins? The largest is the Emperor Penguin and they live in Antarctica. If we travel out to the edge of the sea ice near McMurdo Station, we would occasionally be able to see Emperor Penguins. The smallest is the Fairy (or Little Blue) Penguin, which can be found in Australia and New Zealand. Adelie's are the most numerous of all and Yellow-Eye (in New Zealand) are the most endangered. An Adelie penguin about to belly slide - some penguins can move considerably faster than walking by sliding on their belly if the ice or snow conditions are right. Q: What is the lifespan of a penguin? Jumping cracks in the sea ice is as close to flight that this little penguin may get. Q: What do penguins eat? The penguins in Antarctica live on a diet that is composed of krill, fish and squid. Krill are small crustaceans, much like shrimp/prawns. Q: Do penguins live in Antarctica all year long? Yes, they follow the edge of the sea ice in winter and summer as the sea is their food source. Breeding time is summer for most penguins when the sea ice is close to its lowest extent (except the Emperor Penguin). Adelie Penguins making the long walk across sea ice, out to the ocean. Q: The Antarctic has been experiencing change in recent years, for example, the Peninsula region has been warming, but the maximum extent of sea ice has also been reaching record levels. How do these changes impact penguins? One impact we have seen is that Adelie Penguins are no longer living on the Antarctic Peninsula. The sea ice conditions in summer are not favorable for them any more. 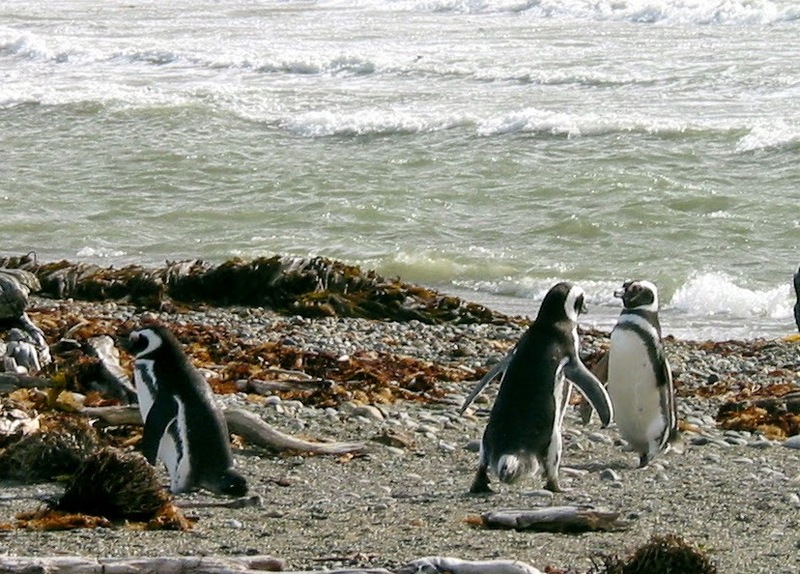 Other breeds of penguins, such as Gentoo's, have become more prevalent on the Peninsula. Mean annual air temperature in some parts of the Antarctic Peninsula have risen 2.8C (5.0F) during the last 50 years of measurements. This is the region of greatest temperature change in the Southern Hemisphere. Magellanic Penguins in Chile. I took this photo back in 2003. Magellanic Penguins are only found in Chile, Argentina and the Falkland Islands.